Since Ludum Dare is launching today, and the indie press is likely to be busy with the contest's activities, I decided to put off the PR push until after the weekend. I've certainly got plenty to work on yet, and I don't want to get lost in the blast radius. Do be sure to check out the games folks are making, though. You're guaranteed to have hours (maybe weeks) of playable content after all is said and done! Surviving the apocalypse? There's an app for that. I'm considering making the iSlab reconfigurable into a few different tools, such as a lamp and a GPS. 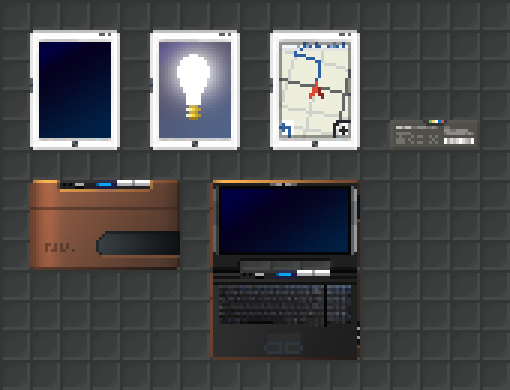 The iSlab will be useless without a charged battery (top right). When powered, however, players can switch the iSlab between different running apps. I'm thinking it may be via the crafting screen, but I'll have to test that out. Below the iSlab, there's a laptop. It'll work in a similar way, though it'll likely be able to do some things the iSlab can't. In particular, I'd like to try and make it a potential hacking tool. Perhaps some (most?) iSlabs are locked until hacked, so players with hacking skill and tools have quicker access to the iSlab's features. I'm also considering making the player's money stat a bank account at the DMC, so it makes a bit more sense than ambiguous "apocalypse dollars." If I do that, I can also make it possible to hack bank account information out of electronics items such as iSlabs, laptops, or maybe even by doing something inside the DMC itself. Then, finding iSlabs is more of a game, as some may have useful data on them (e.g. bank account info or software). Hacking will still be a skill better suited to near-DMC use, but it'll have more opportunities to be useful in the wilderness (in addition to any encounters that might come up). I still have some testing to do here, to make sure all these ideas work. And, of course, electrician and mechanic are still in need of lovin'. But making those skills more valuable was a step long overdue. Between the changes above, and future content/encounters, hopefully techy type characters can have just as much fun as brawlers, trappers, and sneakers. That's all for this week. Have a good weekend! Nah, I don't think hacking is important enough to have a minigame. Just crafting would be fine. Switching iSlab programs would be convenient with options added to the list under second mouse button that says things like "Eat" and "Destroy". Having a working iSlab / netbook and a collection of ebooks might under some circumstances substitute for having some like Trapping (SAS survival handbook), botany, mechanics and so on. This may seem unbalanced, but then we can already find fur cloaks and other items made by survivalists. Would solar panels for renewable energy be an overkill? Maybe not is they produce less than 50kJ per day. Ah, a tetris or pong or something as a game on a iSlab / netbook would be a fun easter egg, but I think Neo Scavenger has higher priorities. How about Sol Solo as minigame? Will there be a (probably expensive) place in the DMC you can go to (maybe some sort of black market?) Where you can get iSlab's hacked or buy hacked iSlabs? It would be useful for people who can't hack iSlabs. And perhaps also a place to charge batteries? I'm glad to see these other skills getting some love. I bought this game for the survival aspect. Scrounging the woods for food, making my own tools, living off the land, but with the city and the new technologies you're coming out with, I'm going to be torn between being a savvy civilian who can get rich and stay in the safety of the city, or a true scavenger. So far I've only built myself for the wilderness, it will be interesting to see some traits that are useful in civilization. You know you've been away too long when you forget your password... All the changes you have been making look awesome so far and I'm very eager to begin checking it all out. Aaron_PK's comment actually sprung an idea to mind. When creating a character say you leave a skill slot blank, would it be out of the range of possibility to allow a character to fill in blank skill slot through some more "Immersive" means? Maybe it could tie in with that thread about achievements, in a sense where the character does something "X" number of times to simulate learning a skill or something to that extent? I like the idea of a minigame, and it'd be a welcome change of pace from NEO Scavenger, though that'll probably remain a low priority until more central content is off the to-do list. Re: right-click menus, I'll have to see what I can do, and how the app-switching feels. Right-click menus are a pretty custom feature, so it's not something I can add via the item's stats. On the other hand, it might not even be possible to do app-switching via crafting, as I'm thinking the apps contained in the computer will cause problems. They'll be emptied out each time, at least, which would be annoying. Battery recharging tools are something I'll probably explore, since more stuff like flashlights and goggles could benefit now. It might be solar, or thermal (like a gas-powered or camp-stove generator), or even plugging into the power main in some areas that still have it (e.g. DMC, cryo). As for hacking iSlabs without the skill, I'm thinking there might be a fence in the sprawl who'd pay better-than-junk money for computers with undisclosed data on them, so non-hackers can still make money from them. And like many other in-game tools, the junk market will likely have laptops or iSlabs and their apps for sale from time-to-time. @JustcallmeX, I'm not sure how long it's been since you last tried it, but have you seen some of the stuff you can acquire in the augmentation clinic? That's along the lines of what I'd like to offer more of in NEO Scavenger: gaining new abilities/skills via some plausible in-game explanation. I know there are a couple of options in the DMC for augmentations, but I was thinking beyond just cash for upgrades. Things like Tough, Strong, even Athlete(the sprinting ability) make sense for augmentations, though I was leaning towards if a skill slot is blank, either by error or by wanting to "Iron Man", there could be tasks that might allow one to learn a skill. Trapping for instance, hunt "X#" of deers and or capture "X#" of squirrels while scavenging. A bit grindy but seems a little more interesting than just hoarding money to buy skills. The most used exactly. There could be others there as well. Following and liking the images.